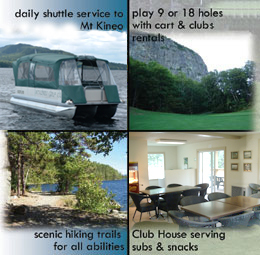 Mt Kineo Golf Course is located on Moosehead Lake and is thought to be the second oldest course in New England, built in the 1880's. The course was built along side of the Kineo House, which at one time was the largest inland waterfront hotel in America.The hotel is long since gone but the beauty of the island remains with Mount Kineo as the centerpiece, rising 1798 feet above the shores of Moosehead Lake from it's summit. Each hole on this nine hole course is a challenge and will test the clubs in your bag. The most scenic hole is the fourth, par 3, 138 yards, over water to a green nestled at the base of Mount Kineo.